The Cap’n Crunch lineup of cereals has never reached the highest echelons of cerealdom for me. Even Crunch Berries, by far my favorite offering from the Cap’n, is a secondary choice for me. But one thing I certainly can’t fault the good Cap’n for is his lack of effort. There seems to be a new “Crunch” cereal maybe twice a year. Some come and go, some stick around longer than you’d think, but the Cap’n likes to spice things up and keep things fresh. Mrs. Crunch must be a very happy lady. 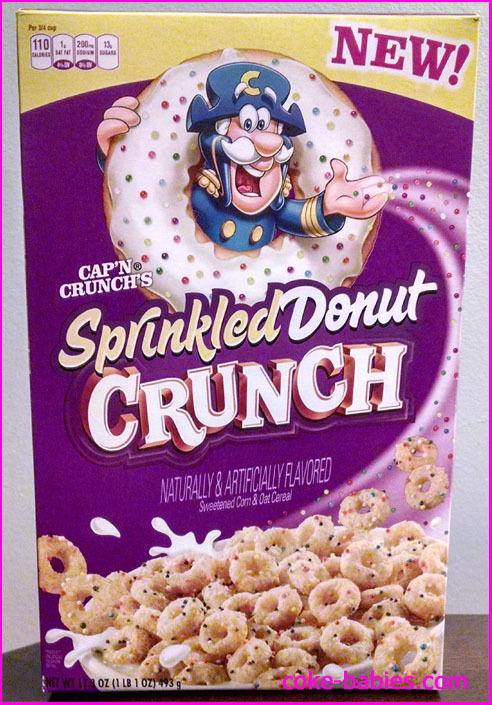 Cap’n’s newest offering, Sprinkled Donut Crunch, prompted a rousing reaction of, “Oh.” when I saw it. I wasn’t sure if it would be good or bad, it just seemed like one of those cereals that would just taste like pure sugar. As an unabashed fan of purple, I like the box design. It’s a bold color and has a big donut on it. That works. One thing I’ve noticed with some of the newer Cap’n cereals is that the boxes are gigantic. They’re approaching Honeycombs territory. As long as the cereal is good, I’m fine with that – more sugar for your dollar. But it’s always a bit sad when I have my first bowlful of something mediocre and think, “Good thing I’ve got twelve more bowls of this to go!” That’s when I fill up my dog’s treat basket with cereal. Opening the box, my fears about the cereal were strengthened – just a pure wall of sugary scent. 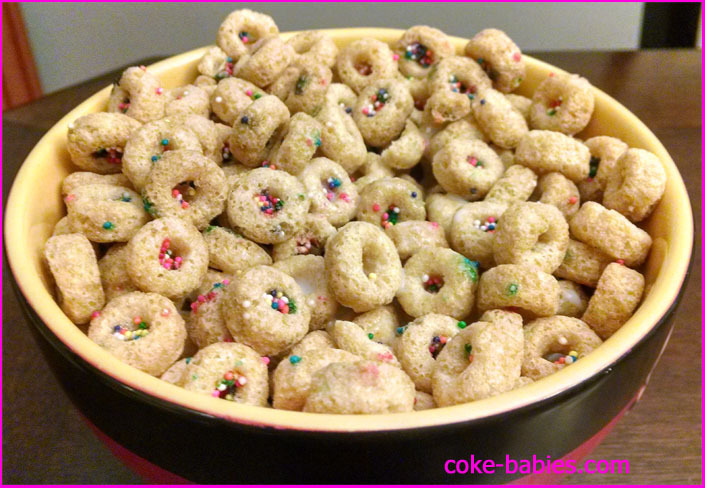 Pouring the cereal, I was impressed with the Cap’s commitment to the donuts being sprinkled. Oftentimes what you see on the box, when it comes to cereal decoration, doesn’t exactly translate into the actual product. But almost every donut piece had multiple sprinkles, some with their donut holes jam-packed with them. Taste-wise, I was surprised by how good it was. The flavor is nothing revelatory, or even particularly amazing. I was just impressed that the cereal was quite good, considering I figured it would just taste like circular pieces of corn syrup. It’s a sugary, slightly vanilla flavor – basically just a sweetened dough flavor. And it works for the cereal. The sweetness level is nowhere near what you might expect – sweet, for sure, but not offensively so. The resulting milk was also lightly sweetened, unlike the thick sludge you can often get with the regular Cap’n Crunch. While I don’t see myself buying this too often, I would buy it again. So that’s a compliment, I guess.